1. More patterns (less stripes). I love patterns and mixing patterns/textures/colors, but mostly I just wear stripes. I've actually lost count of how many striped shirts live in my closet. 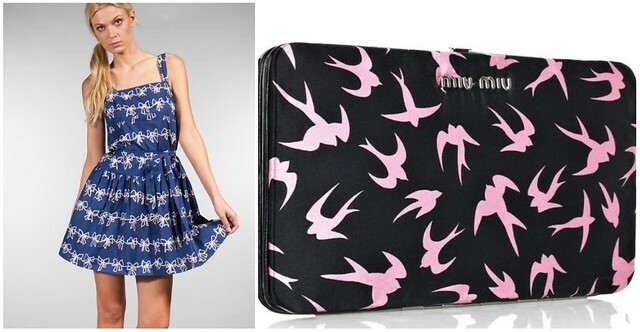 Going from this: Adding simple illustrated designs like this Marc Jacobs dress and Miu Miu clutch. A girl can dream right? 2. I really, desperately need to update my shoe collection and start switching up my footwear once in awhile. 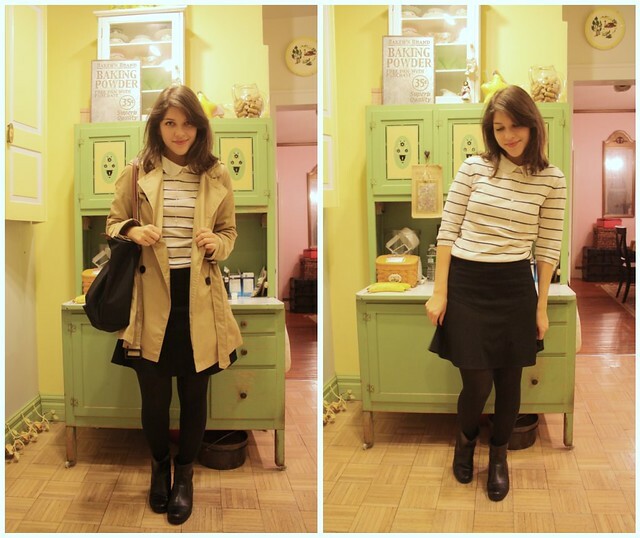 (Please refer to my favorite work-day Aerosoles booties in all my pictures with stripes!) Low heels are my favorite since my commute is so long. I especially like these Irregular Choice, Aldo, and Seychelles options. 3. My favorite color is yellow. It always has been and always will be. So why don't I wear more of it? These are two gorgeous sunshine colored dresses I'm lusting after from ASOS and Alice and Oliva. 4.The most interesting challenge I'm presenting myself with is to buy clothes I really love, not just like because its stylish. If its not exactly what I want I won't buy it in an attempt to buy less. I'd also like to start buying more vintage or thrift store clothes to reduce waste. Perhaps its time to organize a clothing swap too! What are your sartorial changes looking like for 2011? also: go check it out, Amanda from The Upside of Wonder nominated me as a blogger to be featured! I'm going to try to buy less clothes too, always a problem! I love that you mix the patterns for your outfits. They always work so well together! Haha I feel ya! I've got SO many striped shirts. 'Nyways, I'm doing a Burberry perfume giveaway on my blog, just thought I'd let you know girl! I'm just trying to wear more color and stop living in black! Love your shoe choices. I have some just like those gold Seychelles, and they are a life saver. We all have preferences we tend toward. There's nothing wrong with that (you look GREAT in stripes!) but it is nice to add new dimensions to our appearance. I applaud your willingness to expand your looks. Yellow is a great color and would look terrific on you. Go for it! These are really good resolutions. I think I'm going to incorporate numbers three & four into my own list. your issue with overused stripes aside all of these outfits are equally fantastic! i get what you mean with revamping the wardrobe. i've been dreaming for a while of magically getting one of akind pieces for under a few dollars. we can dream right? love the stripes and red tights! lovely. But branching out is fun, cause I'd love to see more of your outfits. Thanks for your sweet comment on my year in review post! I'm lovin' the yellow dress on the right. 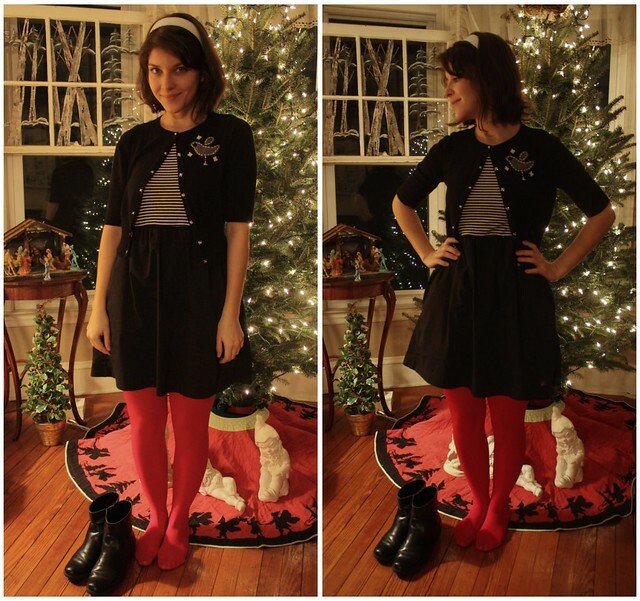 Sartorial changes for 2011: I would love to learn to walk in heels, because, let's be honest. They make every outfit look so much better. I really relate with your resolutions, though you wear stripes so well! But I'm sure you'll succeed and I can't wait to see you doing it! Oh my gosh, you are so pretty! Gah, I'm jealous :P That outfit is adorable! Following. 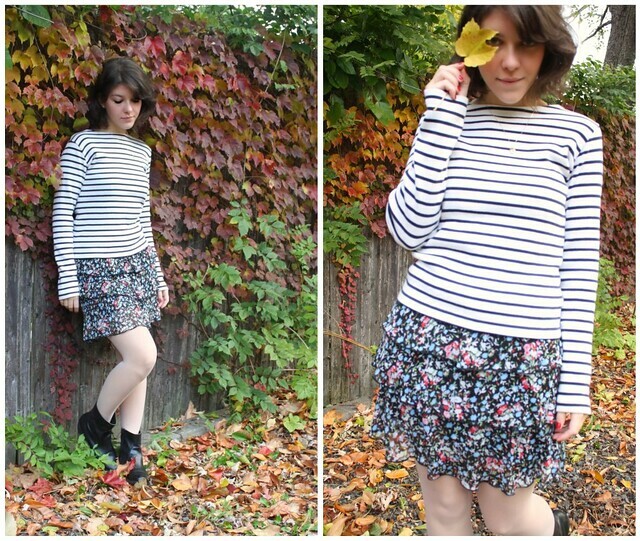 love these outfits and your plans for changing your style up a bit sound lovely! i especially love how you're going to try to mix prints more! Good luck with yours! And go easy on yourself about the stripes...they're addicted. I'm pretty sure they're the heroin of patterns.